River Valley High School students gather in the RVHS computer lab Friday afternoon to voicechat with “Dreamland: The True Tale of America’s Opiate Epidemic” author and journalist Sam Quinones. 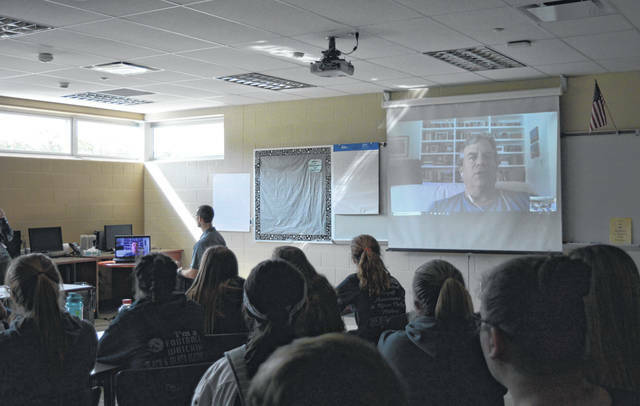 BIDWELL — River Valley High School students in accelerated learning classes gathered in the school computer lab Friday afternoon to have a voicechat session with “Dreamland: The True Tale of America’s Opiate Epidemic” author and journalist Sam Quinones. Over 40 students were present for the discussion. According to RVHS English teacher Aaron Walker, students were asked to read the book over the summer and at one point send letters to Quinones. The writer is known for his time as a reporter with the Los Angeles Times and has garnered himself a reputation nationally for his reporting on Mexico, immigration, drug trafficking and the opioid epidemic. “Dreamland: The True Tale of America’s Opiate Epidemic” was published in 2015 and discusses the illegal Mexican heroin trade along with southern Ohio’s Portsmouth’s role in the opioid crisis. Quinones said in his research he was surprised to see how badly the opioid epidemic had affected more metropolitan and wealthy areas and that they also seemed to have some of the deepest problems in the country. He commented on the nature of how Americans frequently seemed to need to be satisfied immediately in their wants and believe they should go through a life without pain or difficulty, hence a few reasons for why the drug epidemic was happening. The illusion that a pill or drug could solve all problems and the ease with how to gather those drugs made it worse. He remarked that a little disappointment and pain in life was not a bad thing to learn from. Much of pain is temporary. He remarked on the dangers of the medical and pharmaceutical industries in the 90s frequently prescribing opiates for a variety of reasons. Some of those remarks alluded to concerns that healthcare providers were worried about competition. If one did not completely alleviate the pain of a patient, he or she might be worried they might seek out another medical provider for support. Among Quinones’ remarks to the students, he said that much of why he loved journalism was because it led him down different roads in life and in that, learning was a process. As a journalist one was always learning. Writing was a process. Facts led him from one story to another and while one might have an opinion on the things one encounters in life, as a journalist, writing about them ethically meant the writer should not lead a reader astray by his opinion. Stories were connected in a variety of ways. A reader should be able to conclude their own opinion from the facts presented by a journalist. Quinones advised students to pay attention to language and emotionally charged words in modern media. Adjectives often used in writing or speeches could be used to manipulate opinion. He said that a great story is made of details, and it’s important for a journalist to relay those details, but to let a reader decide for themselves what their opinion was on the matter at hand. Students asked Quinones what he thought were some of the more shocking things he had learned from his research. He responded that poppies and opium had been cultivated as early as the Egyptian empires, several hundred years before history’s recording of Christ. He emphasized the point that humankind had been studying the effects of opiates for many years and that they were still the best painkillers commonly recognized by modern science. Opioids were both “Heaven and Hell.” They provided the best relief from pain yet discovered, but at the same time, they were among some the most highly addictive substances yet discovered. Humankind had a tall task in making certain they were utilized responsibly.